A fly-half with a tidy passing and kicking game, Donald made his All Blacks debut off the bench against England in 2008 but has since had to work in the shadow of first-choice No.10 Dan Carter. 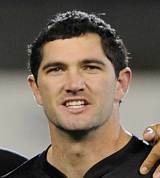 He played a supporting role on the All Blacks Grand Slam tour of Europe at the end of 2008 but a long-term injury to Carter in 2009 opened the door for his rivals. Subsequently Donald saw off the challenge of Luke McAlister to claim the famous No.10 shirt for their Tri-Nations opener later that year. He repaid All Blacks coach Graham Henry with a man of the match display, kicking 17 points in their 22-16 Eden Park triumph. He is a product of New Zealand's age grade system, coming through the Schools and Under 21 teams helping the latter to the 2003 Junior World Cup crown. He later became a veteran member of the Junior All Blacks, with three seasons in the side. He began his provincial rugby career with Counties Manukau before switching to Waikato with whom he won the 2006 Air New Zealand Cup crown. He was also part of the Chiefs side that battled through to the final of Super 14 in 2009 only to be swept aside by the Blue Bulls. After failing to gain a place in New Zealand's initial squad for the 2011 Rugby World Cup, Donald announced that he would be joining Aviva Premiership club Bath. However before joining up with the English side, a series of injuries led to his call up for the All Blacks ahead of their semi-final against Australia. He failed to feature against the Wallabies though took his place again on the bench for the final. And Donald was thrust into the spotlight during the first-half when Aaron Cruden was forced to withdraw through injury in the 33 minute of the final. Despite being the All Blacks' fourth choice fly-half, Donald steered the ship in the second-half and kicked what proved to be the match winning penalty after 45 minutes.